US Secretary of State warns that North Korean denuclearization should come first. 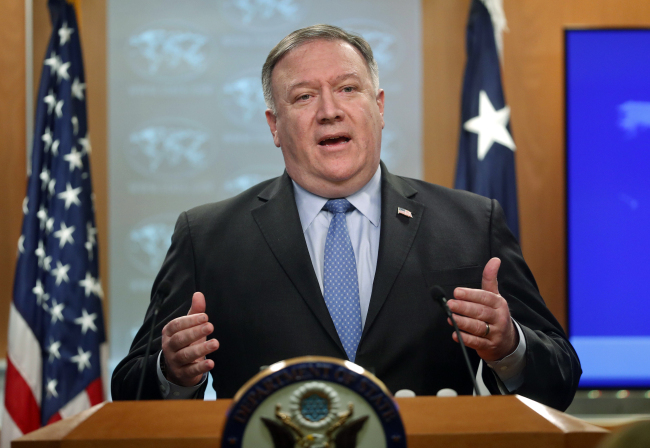 The United States wants to ensure that progress in denuclearizing North Korea is not outpaced by efforts to improve inter-Korean ties, US Secretary of State Mike Pompeo said Tuesday. Pompeo’s remark underscores US concerns that a recent flurry of inter-Korean activity could undermine sanctions placed on the North for its nuclear weapons and ballistic missile programs. And the working group is designed to ensure that “we can be sure that we don’t talk past each other, that we don’t take an action, or the South Koreans don’t take an action that the other is unaware of or hasn’t had a chance to comment on, or provide their thoughts,” according to the top US diplomat. The working group is led on the South Korean side by Lee Do-hoon, special representative for Korean Peninsula peace and security affairs, and on the US side by Special Representative for North Korea Stephen Biegun. A joint field survey of the railroad linking Seoul to the North Korean city of Sinuiju was scheduled to begin late last month, but the US has apparently voiced concerns that such projects could dampen United Nations sanctions on the regime. Meanwhile, South Korea has been eager to expand cross-border exchanges in a bid to spur the North’s denuclearization, a commitment made by North Korean leader Kim Jong-un at his historic summits this year with South Korean President Moon Jae-in and US President Donald Trump. South Korea has also said it expects Kim to visit Seoul before the end of the year in line with an agreement reached during the last inter-Korean summit in September.